I am pleased to announce that A Biographical Encyclopedia of Early Modern Englishwomen: Exemplary Lives and Memorable Acts, 1500-1650 has been published at long last! The book is intended to be a reference work and is priced for the academic market accordingly. Even the Kindle version is $119.00. My author discount to purchase my own copy was still $78 - but a worthwhile investment. My interest in this subject is primarily driven to dispel the myth that 16th century women were docile subjects of the men in their lives. Research shows that women exercised significant autonomy and agency in pursuit of their goals and on behalf of their families. Most of my ten articles are about women in the extended Carey-Knollys kinship network. Two of my favorite women are Frances Howard, Countess of Kildare and Odelia de Morada Knollys. 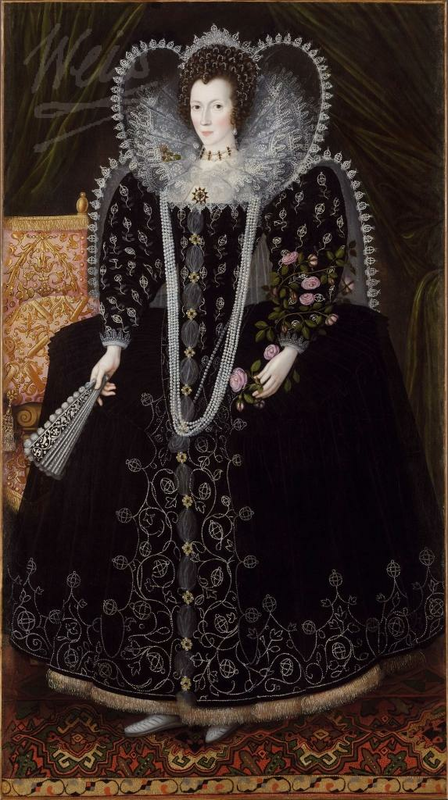 Frances Howard, Countess of Kildare by 1601 when she acquired a new husband and the title Baroness Cobham. This image courtesy of the Weiss Gallery. At 16 and married for almost five months, Frances Howard, the young Countess of Kildare, convinced her father, the lord admiral, to make her new husband the vice admiral of Ireland, even though England did not actually control much of Ireland. Not content to let the appointment stay a matter of family business, she took it upon herself to see the appointment officiated at the Court of Admiralty. Discovering the letter from Frances to the judge at the Court of Admiralty in the British Library archives validated my doctoral research plan. It was thrilling finding the letter in a bundle labelled 'Letters from Gentlemen to the Court of Admiralty'. This was the moment I knew the project would work. On January 3, 1589, Odelia de Morada arranged her own abduction from Dordecht to save herself from marriage to a Spanish Catholic cousin. It's not clear if Odelia minded the fact that her intended was Spanish or Catholic. The Protestant bridegroom she chose to marry instead was Thomas Knollys, first cousin once removed of Queen Elizabeth I. Thomas was serving with the English forces in the Low Countries, as was his cousin Thomas Morgan, who abducted Odelia's sister at the same time. This was a big deal as the sisters were daughters to the Marchioness of Bergen Op Zoom who sent a war ship after them and then sued in international court at The Hague - the same place international war crimes are pursued today. The staged 'ravishment' was a success and Odelia traveled to England to live with her new sisters-in-law until her husband returned from the war. Unfortunately no known image of Odelia exists. There is so much more, but only so much one can cover in an Encyclopedia or a blog post.